Acorns grow on what kind of tree? What' the first organism to grow back after fire? What plant eases the pain from a sunburn? In what mountain range is Mount Everest located? What fictional city is the home of Batman? What does the "N" stand for in NATO? Where would you find Mount Rushmore? What's the official language of the Canadian province Quebec? In "The Wizard of Oz", what did the Scarecrow want from the wizard? What school does Harry Potter attend? Animals that live part on land and part in water are known as what? Congratulations! 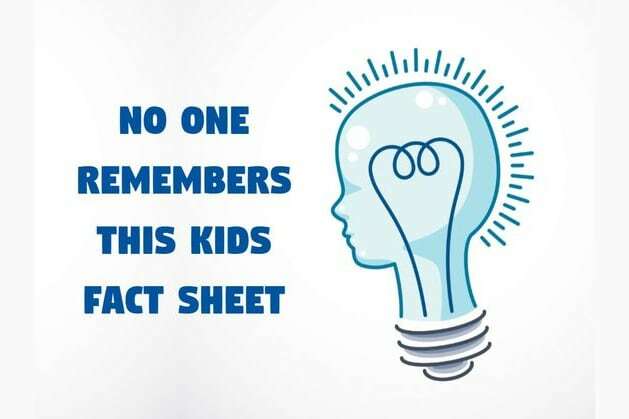 You remember a fact sheet that only 5 in 100 adults do. You must have been a very smart youngster with an exceptionally high IQ. Share this Kids Fact Sheet to test everyone you know. You almost passed. Share this Kids Fact Sheet to test everyone you know. We gave this Kids' Fact Sheet to 100 people and only 5 aced it.